Manufacturer & Trader of Waste Bin. Our product range also comprises of Barbeque Grill, Refrigeration Equipment and Cooking Equipment. A flourishing enterprise in this domain, engaged in presenting a wide range of Stainless Steel Kitchen Waste Bin. 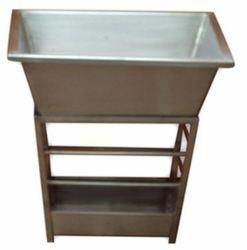 This bin finds large application use in eateries, restaurants, hotels, commercial kitchen and food stalls. Quick cleaning and accurate space is the most impressive feature of the bin. In order to provide excellent production from the bin, our professionals after manufacturing the bin opts for strict quality checks. The offered quality checks include accuracy, circular degree, alignment, power distribution and rotating speed. Looking for Waste Bin ?